Playing handball at Bessemer Park and singing in the glee club. Building up a house, play handball, squash and Raquetball. 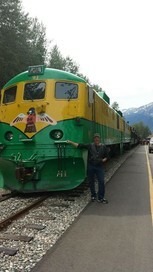 Ride motorcycle, play guitar/banjo/harp, practice magic, bicycle, practice magic, am a model railroader, and travel. Too much stuff! I still play folk-type music. Maybe that I've had a successful career. Various places around the globe. Across the country many times by motorcycle. Travel to the unknown places. Larry Dalke has a birthday today. Larry Dalke updated his profile. View. Larry Dalke added a comment on his Profile. New comment added. Larry Dalke has left an In Memory comment for Robert Springer. Larry Dalke posted a message. One of the sweetest gals I knew! Larry Dalke changed his profile picture.